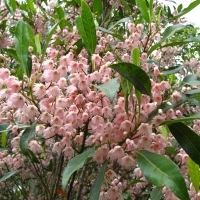 Small upright tree with masses of dainty, white, fringed bell flowers followed by bird attractive blue berries. 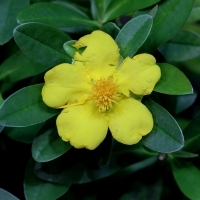 A strikingly beautiful with a dense crown of foliage, needs little maintenance to thrive, surviving well in low nutrient and dry soils, grows well from shade through to full sun. 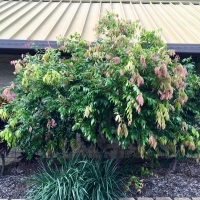 A shrub or small tree, large specimens often flanged at the base. 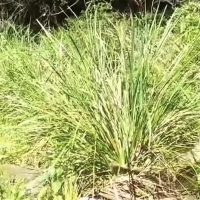 Distribution form the Richmond river to Mount Tambourine. 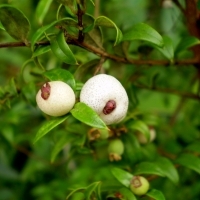 An evergreen shrub or small tree. 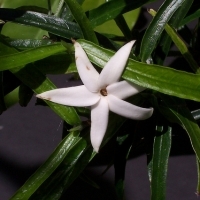 In summer bears an abundance of fragrant white flowers that show up well against the dark green foliage followed by clusters of black berries. 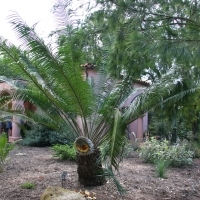 A native cycad with a sturdy trunk and palm-like, green leaves up to 1.8m long. 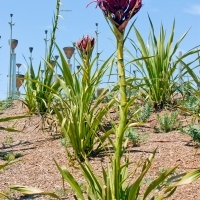 Grows in full sun or full shade and tolerates light frosts. 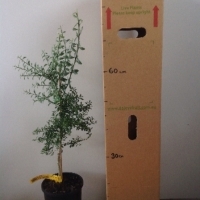 Ideal for large containers or general garden planting. 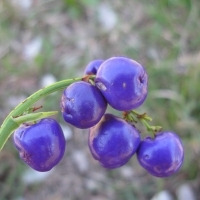 Commonly known as waxflower native hoya is found on rocky slopes of dry rainforest margins. 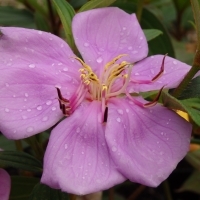 It is a popular potted house plant where it enjoys a well lit position and is ideal for hanging baskets, verandahs and patios. 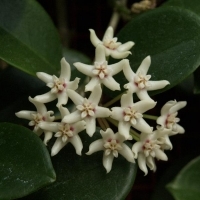 The native Hoya is noted for its fragrant flowers. 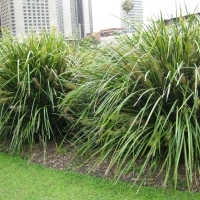 It grows 4-10 m in ideal climates but can be pruned to a shorter length. 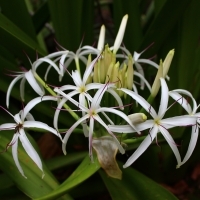 It is the host plant for the caterpillars of the Common Australian Crow butterfly and its flowers are pollinated by the Grass-dart. 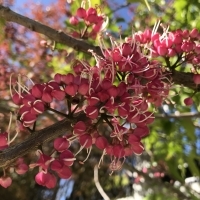 This 1-2m shrub has an attractive display of white, pink and mauve flowers throughout summer, followed by small purple bird attracting fruits. 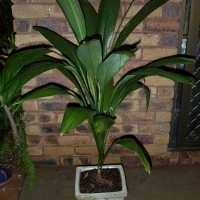 Fast growing, requires regular pruning to keep it bushy shape. 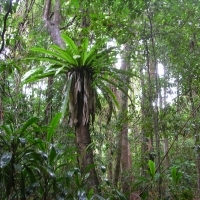 An epiphyte fern that grows on rocks and on trees where large specimens can circle the tree trunk. 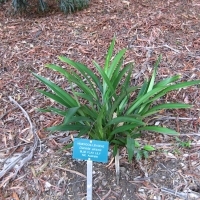 native to eastern New South Wales and Queensland. 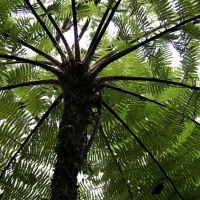 The clumps can reach a large size, with the centre of the fern acting as a reservoir for debris. 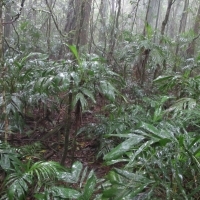 They make a spectacular understory planting in rainforest gardens, and are suitable for growing in shade houses and as house plants in a shaded position. 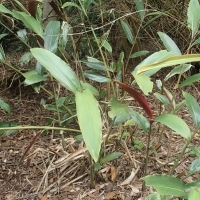 This small shrub belongs to an ancient and primitive family of plants with only one other member the Bolwarra - Eupomatia laurina. 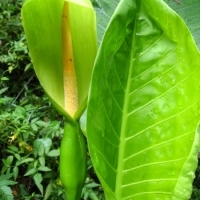 The flowers appear for only one day during which time they are pollinated by a tiny weevil. 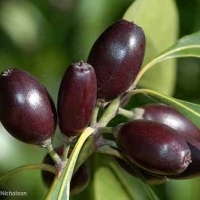 they are one of the earliest examples of flowering plant and are found as an understory plant in the rainforests of northern NSW and southern Qld. 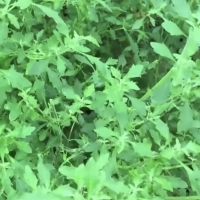 Plants require a shady position. 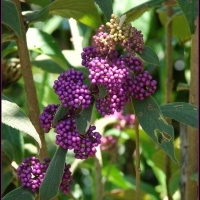 Gorgeous scented flowers, and ornamental fruit and flowers make this an attractive small shrub for any bush food garden. 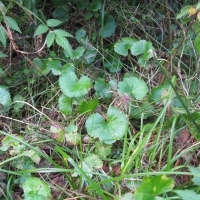 The fruit often appear in large numbers in the winter. 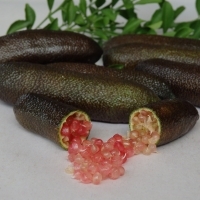 The sweet pink pulp with a bitter after taste surrounds the hard cream coloured seeds. 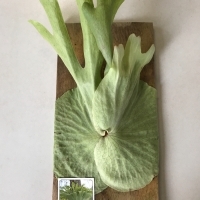 Slow growing. 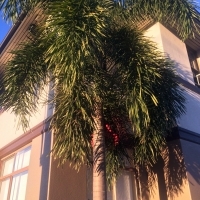 A striking landscaping plant to 3 meters. 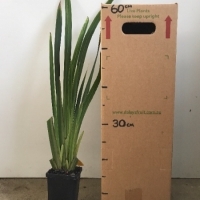 Slow growing and as they age they develop a thick trunk much like a grass tree. 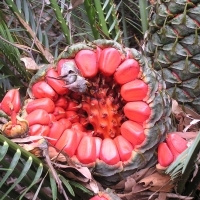 A member of the cycad family. 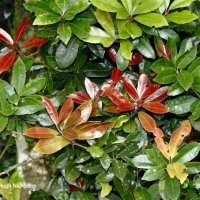 Ideal for using as an understory plant in a partial shade position. 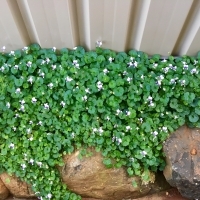 An understory plant native to mid north NSW to North QLD. 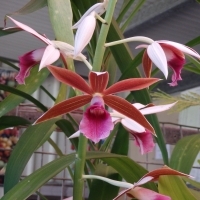 Appreciates good light but not direct sun. 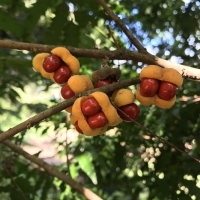 These pretty yellow fruits resemble tiny bananas however they are not edible. 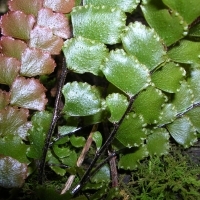 An excellent ground cover fern with an attractive pink flush. 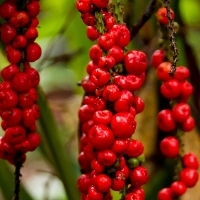 Native to rainforest and wet schlerophyll forests it adapts readily to cultivation although may be slow growing. 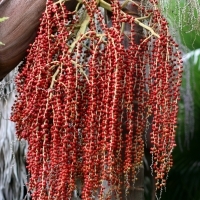 It is more tolerant of sun and drying out than other fern species and is perfect for hanging baskets. 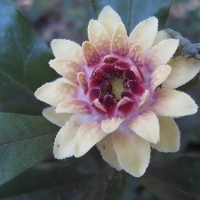 Uncommon, this shrub grows to about 3m, it is native to rainforests of Springbrook and Mt Glorious. 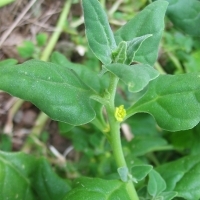 Bright yellow pea flowers during the winter and spring make this an attractive adition to rainforest gardens and regeneration plots. 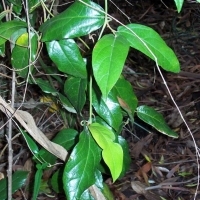 An understory tree of 10 - 12 m, from Byron Bay to the northern tip of Cape York. 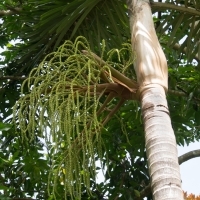 Slow growing but forms a well shaped bushy tree. 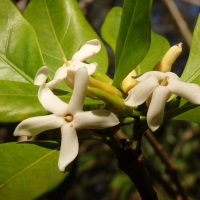 Listed vulnerable species in the wild, attractive small shrub, yellow pea flowers in spring, sparsely branched, Subtropical and dry rainforest species. 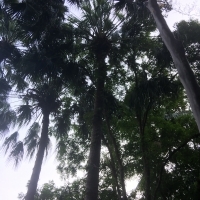 A large and spectacular cycad that is endemic to New South Wales and which, by far, is the largest of the New South Wales Macrozamia species, with a stout columnar trunk ranging up to 3 meters in height. 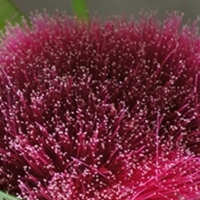 Medium shrub to 3m. 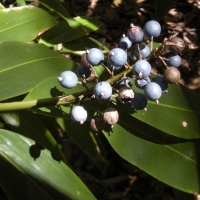 Compound leaves similar to those of the Umbrella Tree. 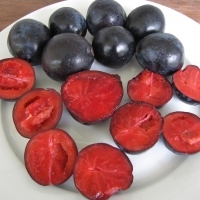 Bluish fruits with dark red flesh and juice. 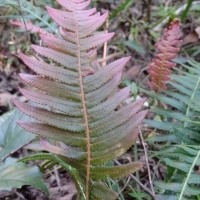 Sometimes called a prickly alyxia due to the stiff prickly leaves. 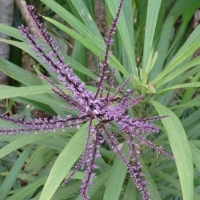 A rainforest plant from Wollongong. 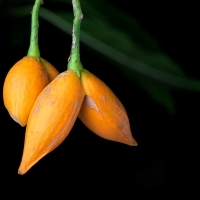 Attractive orange fruit. 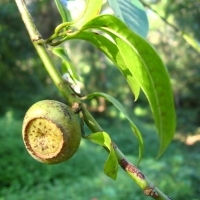 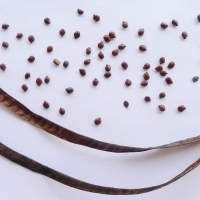 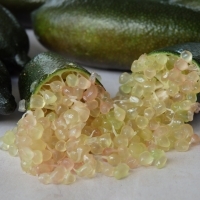 It is often seed used as a native alternative to the Murraya paniculata. 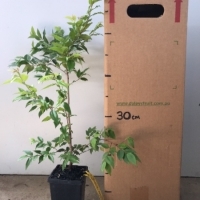 Shrub or small tree to about 4m, it is found in litoral and subtropical rainforests of northern NSW and southern Queensland.� It is a slow growing plant with stunning maroon new growth, well suited to semi shaded area or pot culture it can be grown indoors. 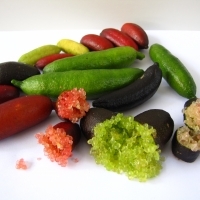 It is the food plant for the grubs of the rainforest regent skipper butterfly Euschemon rafflesia.